Nusa Dua Bali, Indonesia, June 21, 2014 - (ACN Newswire) - Bali continues to receive international attention for its alarming waste problem. Last March 2014, Huffington Post published an article called, "Why You Should Take Bali Off Your Bucket List", highlighting the growing amount of rubbish on Bali's famous beaches and referring the situation as an environmental disaster. "We all should be very concerned," says Nita Sofiani, Miss Earth Indonesia 2013, who joined 'Bali's Big Eco Weekend 2014' to bring nation's awareness to the situation faced by Indonesia's most favoured island. "As Indonesians, we're all proud of Bali and we enjoy what the island has to offer. Therefore it's our responsibility to advocate its image to the rest of the world by helping to keep it clean." 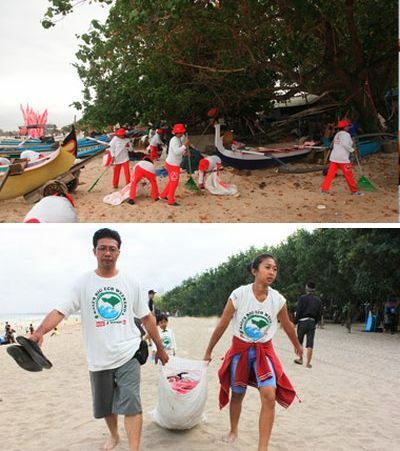 Along with thousands of visitors, Nita and Yossico Stephanie, Miss Earth - Eco Tourism Indonesia 2013 rolled up their sleeves and picked up the waste in Padma Beach, Legian-Bali, as part of Bali's Big Eco Weekend 2014, held by Coca-Cola Amatil Indonesia, Quiksilver, and Garuda Indonesia. The annual eco festival is held for its 7th time this year in an effort to bring more attention to Bali's environmental state. "We are very happy to be part of this great initiative," says Yossico Stephanie, Miss Earth - Eco Tourism Indonesia 2013. "At the end of the day, this is not just Bali's problem, but a problem for all of us as Indonesians. I always love going to Bali, the world loves coming to Bali, and I'm sure you do too. So you just have to protect what you love." A number of world's famous surfers - Mark Richards, Jake Paterson, Craig Anderson, Matt Hoy, Freddy Patacchia, Sally Fitzgibbon, Kalea Moniz, Rosy Hodge, and Bruna Schmitz also took part in the event, hoping to inspire other surfers around the world who represent a big chunk of Bali's tourists. The three companies also shared their eco innovations in the event; such as Coca-Cola's environmental packaging stewardship, Quiksilver's most eco-friendly board shorts, and Garuda Indonesia's eco books. Coca-Cola Amatil Indonesia and Quiksilver started 'Bali's Beach Clean Up' (BBCU) program in 2008, inviting Garuda Indonesia to join the initiative in 2012 after realizing that the problem demands more hands to create bigger change. Since its inception the program has employed 75 beach clean-up crews, 4 tractors, 3 rubbish trucks, 2 barber surf rakes, and has provided over 1,200 waste bins to help remove the trash along Kuta, Legian, Seminyak, Jimbaran, and Kedonganan beaches. In January 2013, the program collected 373,500 kg of waste from the five beaches, and in January 2014, the number jumped 45% to 540,000 kg. This became a reason for taking this year's 'Bali's Big Eco Weekend' (BBEW) to a higher level, inviting more local participations and international influencers to Bali to pick up the waste together. Aside from the Beach Clean Up agenda, Bali's Big Eco Weekend 2014 offers a series of eco activities to inspire others to have fun while still keeping the beaches clean. Many sports activities such as a Surfing Competition, Coke Kicks, and Volley Ball were open for visitors to try while enjoying an eco talk show from Bali's famous community bloggers Bale Bengong and a range of eco food stalls to choose from. The afternoon ceremony received wide attention with the live appearance of Millane Fernandez singing the Coca-Cola World Cup 2014 anthem Dunia Kita, which ended with all visitors releasing 1,000 baby sea turtles to their natural habitat. On Sunday June 22nd, visitors are welcome to join surfing legends in Uluwatu for the most-awaited Quiksilver Uluwatu Surf Challenge 2014. "At Coca-Cola, we believe we have a role and responsibility to play in helping to create a sustainable environment anywhere we operate, whether it's the beaches in Bali or a metropolis like Jakarta or Surabaya. We've invested in 'Bali's Beach Clean Up' program since 2008 and we plan to help for as long as we can. But we also want to get as much support as we can because it's about all of us making the right decisions and taking real actions," says Kadir Gunduz, President Director of Coca-Cola Amatil Indonesia. "Quiksilver is excited going into our 7th year of this CSR initiative with Coca Cola Amatil Indonesia and Garuda Indonesia. This year's Bali's Big Eco Weekend coincides with the launch of our new AG47 recycled board short, the pinnacle of performance technology which will be worn loud and proud by our elite athletes this weekend. We all at Quiksilver strongly feel we are making a difference not only by keeping the beaches clean but by also educating the local and international tourists alike on waste management and its concern on this precious island. Local government and industry are starting to recognize our efforts and becoming more supportive of our cause also which is great," says Paul Hutson, CEO of Quiksilver South East Asia. Heriyanto Agung Putra, EVP Human Capital & Corporate Affairs of Garuda Indonesia said, "Garuda Indonesia has always been committed to conserving the environment through various programs and activities carried out together with other institutions. One of them is 'Bali Beach Clean Up' program, through which we continuously participate in cleaning Bali's coastal areas, including Kedongan, Kuta, Legian, Seminyak and Jimbaran beach. Together with Coca Cola and Quicksilver, Garuda will ensure that Bali's beautiful beaches stay clean and comfortable for tourists so that Bali remains one of the world best tourist destinations," said Heriyanto. "Through its CSR program, Garuda Indonesia has implemented various programs to participate in preserving the environment, such as the "one passenger one tree" tree planting program in Sebangau, Kalimantan, and a fuel conservation program, as part of Garuda Indonesia's commitment to reduce carbon emissions," Heriyanto added. For more information on the 'Bali's Beach Clean Up' program, download the latest Infographic at http://bbew.coca-colaamatil.co.id. Presenting a new level of service excellence in air travel, Garuda Indonesia, the national airline of Indonesia, seamlessly connects 83 destinations worldwide, including exotic locations across the beautiful archipelago of Indonesia. With more than 600 daily flights and a fleet of 196 aircrafts by January 2017, Garuda Indonesia proudly serves its passengers with the award-winning distinct service "Garuda Indonesia Experience", highlighting Indonesia's warm hospitality and rich diverse culture. To provide better and more convenient services, Garuda Indonesia continuously strives through its ongoing transformation program. The progress of the transformation can be seen from the achievement of a Skytrax's 5-star Airline rating as well as the winning of the prestigious "The World's Best Cabin Crew" for four consecutive years in 2014 to 2017 and "The World's Most Loved Airline 2016", also from Skytrax. Please visit www.garuda-indonesia.com. Coca-Cola Amatil Indonesia (CCAI) is a manufacturer and distributor of soft drinks in Indonesia under the license of The Coca-Cola Company. CCAI is a holding company of Coca-Cola Amatil (CCA), based in Sydney, Australia and is one of the largest manufacturers of non-alcoholic beverages in the Asia Pacific and is one of the five largest manufacturers of Coca-Cola in the world. CCAI has 9 manufacturing facilities spread across Cibitung-Bekasi, Cikedokan-Bekasi, Medan, Padang, Lampung, Bandung, Semarang, Surabaya, and Denpasar. Employing over 8,000 people with 90 distribution points across Indonesia, CCAI distributes beverage freshness to hundreds of thousands of outlets in various parts of the archipelago. For more information about Coca-Cola Amatil Indonesia, please visit www.coca-colaamatil.co.id.